Guns, unlikely talents and Pyramids of Mars (1975) | Randomwhoness: a Doctor Who blog by Johnny Spandrell. Sampling stories in random order. But do you, Sarah Jane Smith? Do you? Because where exactly did you learn to load and fire a rifle? And how did you become such a crack shot? I can’t imagine where in this character’s back story this happened. Did Aunt Lavinia take her duck hunting as a young girl? Were there a few awkward dates with that dishy Mike Yates at the local rifle range? Even if we accept that at some stage Sarah gained enough experience firing a rifle to hit a small box surrounded by robot mummies from some considerable distance away, how does she know how to fire one of 1913 vintage? After all, she’s from 1980 (don’t worry, I’m not going near that one), as she never shuts up about! It’s a blatant example of an amusing occasional feature of Doctor Who – a companion suddenly and inexplicably displaying a hitheto unmentioned talent, which is wildly out of character. Had the Doctor been the one to fire the rifle, that’s just about believable. Even if the militarily trained Harry had still been around, he could have got away with it. But Sarah? Sorry, that’s weird. But we should be used to it. There’s lots of it about. In The Gunfighters, Dodo, who’s shown no musical tendencies to date, can suddenly play the piano. And quite brilliantly too; she sight reads a jaunty, fiddly little opus without hesitation or mistake. She’s quite the virtuoso. Much later Australian air hostess Tegan, reveals she can fluently speak an ancient Aboriginal dialect in Four To Doomsday. Even though there would have been little call for that on the job application for Air Australia. And lately, Clara discovered that although she and the TARDIS don’t get on, she can pilot it with remarkable accuracy through a opening into a pocket universe and carry the Doctor home in Hide. Right back at the series’ beginning, Ian Chesterton showed a remarkable prowess for fighting, seeing off Aztecs and Saracens and lots of other trained killers. I wonder how he picked that up in his day job as a science teacher? And at the other end of Doctor Who, lovable nurse Rory Williams suddenly discovers he can ride a motorbike when the plot of Let’s Kill Hitler demands it. At least on that occasion, writer Steven Moffat apologetically points to this sudden turn of convenience. “Can you ride a motorbike?”, asks Amy. “I expect so”, says Rory, “It’s been that kind of day”. And lucky old us, there’s yet another example in Pyramids of Mars. As mentioned above, the Doctor is disguised a mummy. Now, with its bandages off, we can see that the mummy is a robot built with a burly humanoid frame (with a hefty cleft of a chest; Mrs Spandrell frowned at the TV and said, “look at the cleavage on that monster”). Now the Doctor as played by Tom, is tall and skinny. If you tried to wrap him up in bandages, he’d look nothing like the robot mummy. In fact he’d look like a beanpole covered in grey toilet paper. Also, because we can’t see his trademark coat and scarf discarded on the floor, we can only assume he’s wearing them under all those bandages. So now it’s an awkwardly lumpy beanpole covered in grey toilet paper. So let’s assume that actually, he climbs inside that robot’s frame, and that’s what Sarah wraps up. Personally, I can’t see how he fits in it, but OK whatever. But here’s the thing: Sarah wraps up a Time Lord, fully dressed, squashed into a robot frame and on her first attempt… she does it up perfectly. It’s identical! Amazing! 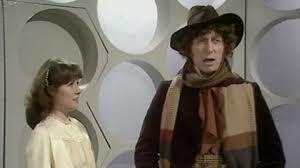 That Sutekh doesn’t stand a chance against Sarah Jane Smith – journalist, crack shot and expert mummy wrapper! LINKS TO The Caves of Androzani: Both are written by Holmes and both feature masked villains. Both use the word “perfidious”. NEXT TIME… I’ll show you where my ankle’s going! It’s Army of Ghosts/Doomsday. Pingback: Break ups, break downs and Mummy on the Orient Express (2014) | Randomwhoness: a Doctor Who blog by Johnny Spandrell. Sampling stories in random order.